Choosing a preschool can be an extremely daunting task for parents. For many children, preschool is the very first time they are spending time away from mom or dad. While this is an important milestone for little ones, it can also be so, so scary! As a preschool teacher (and mom) myself, I can speak first-hand to the anxiety that parents feel when they bring their child to school for the first time. Most of the time it’s mom shedding more tears than the child! For me, this is the #1 priority in choosing a preschool. Young children learn best through exploring their environment, hands-on experiences, and through play! I love seeing preschool schedules that allow for long stretches of independent play. The more time that children have to explore and play on their own means the more time they have for interacting with peers, navigating conflict resolution, and building on their imagination (all things they need to be successful in Kindergarten!). Many early childhood teaching philosophies (Montessori, Reggio Emilia, Waldorf, to name a few) have one similar characteristic that is so important to look for in your child’s preschool: the teacher acts as a guide. Instead of assuming that we need to sit kids down and teach them the alphabet, play-based environments may set out alphabet blocks and let the children explore on their own, posing questions as needed to enrich the child’s thinking. This leads to more meaningful, interest-based learning for the child. Discipline is another huge question to ask about when you are touring prospective preschools. Preschoolers are still very new at being able to regulate themselves, and they are still learning about how to interact with peers in a socially appropriate way. In terms of discipline, it’s so important to find a preschool that emphasizes depth in conflict resolution, and views children as problem-solvers. Giving children a time-out and making them say “sorry” isn’t enough. Children need to understand the reason why they are being asked to take time away from the group. For example, a teacher may say “I cannot let you hurt Billy, you need to take a break to calm your body down.” Then when the child is calm, they need to be encouraged to make amends with the child they have harmed. Over time, this teaches them how to behave with other children, personal responsibility for their actions and empathy towards others. Viewing children as problem-solvers when it comes to conflict resolution is another important factor in a school’s discipline policy. Imagine two children are fighting over the same toy, and a teacher approaches them to help. Many times a teacher may say “Johnny had the toy first, so Billy you need to wait until he is done with it.” In this scenario the teacher has “solved” the problem and the children are required to follow her directive or risk being disciplined. Instead, the teacher has the option to “facilitate” conflict resolution between the children by saying “I see that you both want this toy, what can we do to solve this problem?” You’d be amazed at some of the solutions that children come up with on their own! This approach builds children’s confidence in their own abilities to collaborate with one another. Preschoolers are at a critical stage of development when they naturally begin to do more things on their own. Since independence is rapidly emerging during these early years, it’s important to find a preschool that will encourage independence through it’s environment and teaching strategies. This means having child-sized equipment, tables, chairs, shelves, step-stools (when appropriate), and lower toilets and sinks. Children should be encouraged to try to do everyday tasks for themselves, and only ask for help when needed. Being independent is one way your child is building their self-confidence, so it’s not something to take lightly. Without it, children may struggle in kindergarten where they are expected to do most everything on their own. The ratio of children to teachers in a preschool program can vary a ton from program to program. General guidelines for ratios are set by the child’s age, and most programs have at least a 1:8 adult-child ratio for preschool aged children. Keep in mind that the 1:8 ratio can be met with teacher assistants and aides, and that a certified preschool teacher can supervise up to 28 children in some cases. It has been my experience that the lower the ratio of teachers to children, the better quality the preschool environment. With lower ratios, teachers are usually less stressed and have more opportunities to facilitate interactions between the children rather than just supervising large groups. There are also more opportunities for in-depth projects and activities that are derived from the children’s interests. This one is a no-brainer. Germs are abundant in all preschools, so finding one that has a high standard for cleanliness is really important in minimizing the amount of illnesses your child experiences. Ask any prospective preschools what kind of illness policy they have (these policies can vary a lot between programs). Most places do a good job of wiping down toys and taking care to wash things that have been directly in children’s mouths. Some places have a “wash bucket” to put toys in throughout the day that need extra sanitizing. Frequent hand washing procedures also helps a ton to reduce the risk of spreading illness. So there you have it – my top five things to look for when choosing a preschool program for your little one… What was your #1 priority in choosing a preschool for your child? Share with me in the comments below! Oh my goodness, the ratio is a big one for me!! We were blessed to have a nanny for our daughter until she turned two and then we found the perfect preschool – absolutely love them. They have a cap on how many children they have in each classroom and it allows so much one-on-one time while also letting her get used to being around other kids. Seeing how much she loves school has lifted such a burden off of my heart. Letting them go that first time is so hard! Ratio is a huge one! I find nowadays many are trying to save money and overwhelm their teachers! It is definitely good advice!!! This is great and I love that you emphasize play based learning as being super important! I love these tips! My husband and I are soon going to be looking at preschools to find the perfect one! I will keep these ideas in mind! Thank you for this! I am looking for a preschool for my son as we speak. Great reminders!! I like that you mentioned checking out the preschool’s discipline policy. This is something that might be frequently overlooked. You want to make sure your child will be disciplined correctly though. This will make a big difference in their performance at school and how they behave at home as well. My aunt will be having another baby soon, so she’s looking to put her other children in preschool, as it will help them learn and give her time to take care of the baby. I love how you mentioned that you’ll want to make sure that that teacher to child ratio is at least 1:8, as this will help your child get the attention they need. I’ll share these tips will my aunt, so she can find the best preschool for her kids. You really do need to be careful when choosing a preschool that your child will attend. I particularly like that the article brings up a discipline policy as something you will have to look into. After all, you want to make sure that the school’s discipline policy matches your own beliefs. It’s cool that you said that a Christian preschool should offer your children fun experiences for them to try out. I also like how you mentioned that there should be a good form of discipline at the school too. My husband and I are looking for a traditional Christian preschool for our son to go to to get an early start on his education. Thanks for the advice about checking a kindergarten’s discipline policy. It would make sense to find somewhere that is going to properly educate and discipline kids when they need it. My daughter needs a kindergarten for her son, so she’ll have to check their discipline policy first. My sister just moved into a new area that has a need for her to get a pre-school for her son. She wants some tips to make sure that she is choosing the right place. It would help her to know that cleanliness is an important part of choosing one to avoid health issues. I really appreciate your tip on making sure that your child has self-confidence when they are going to school. My wife and I have been thinking of getting a new house, and we are concerned that we won’t be able to find a preschool next to our old house that our son will like. I will be sure to tell my wife that we should try and find a preschool that promotes self-confidence. It got me when you mentioned that I need to choose a school that has a high regard for cleanliness in order to make sure that my little sister does not get sick often. I will mention this to my parents since they will be enrolling her in a preschool program in the near future. Since she is a bit sickly as she is, it is important that we choose a preschool that is clean so as to minimize her exposure to allergens and other germs. I really like the part where you talked about how important it is to look for schools that hold high standards of cleanliness to avoid any illnesses. Not only will this ensure that my kid is in a safe and clean environment, but it will also tell me that the establishment pays attention to the details. This will say a lot about the quality of work and the amount of love they really have at the children in the building. This is a good checklist. All the factors you’ve mentioned are important, but two really stand out for me—cleanliness and the teacher/student ratio. Anyone with kids knows that preschools (and schools) are germ factories, but not every preschool has a strong cleaning protocol. Illnesses are going to be spread, but there are many ways to reduce them via rigorous hygiene practices. As someone else mentioned, the lower the teacher/student ratio, the better. I am shocked when I hear of how many kids one teacher gets assigned in some preschools. Not acceptable and it should be a deal-breaker for any parent searching for the right preschool. I need to start searching for a school for my daughter next year. I definitely want to find a school that has a good discipline policy. A teacher should teach young kids about how to interact with their peers in an appropriate way too, like you said. When it comes to cleanliness, are there any industry standards for pre-schools? I’m always hearing parents complain about kids coming home sick and one of the biggest issues (at least that I’ve heard) is due to parents sending sick kids to the preschool. Is it okay to ask a preschool what their policy is on when parents send in sick kids? Thanks for pointing out how parents should look into getting their children into a preschool with a 1:8 personnel to child ratio. My son is just about old enough to be in a preschool, so I will definitely want to be confident that there is enough professional supervision in the building. This tip will surely help me find a facility that can make me feel confident about my child’s safety. I liked what you said about finding a preschool that will help to encourage independence. I never thought about how my daughter is getting more independent, but it would be great to cultivate that so she can find success later in life. We’ll be sure to keep this in mind during our search for a preschool. You’ve got great advice here for choosing a preschool. I love how you said that the school should encourage independence and growth. My son is definitely already trying to do a lot of things on his own, so that will be important when he starts school. I’m glad you pointed out that we should consider the cleanliness of the preschool. My husband and I need to find a preschool for our son. Your tip will be very helpful as we try to make a decision. I like that you mention finding a preschool with an early childhood education program that helps kids explore their environment and provides hands-on experiences. When choosing one, it might help to research them online so you can learn about their program and get their contact information. This could give you the opportunity to call them in order to set up an appointment so you can check out the preschool and talk to the instructors about their methods and how they care for the children. My son is just getting old enough to go to preschool and my wife and I want to look into that for him. I agree especially with the first two things that you say to look for in a preschool. It is important to make sure that the children are learning in the best way possible, which, very often is through the exploration of the physical rather than metaphysical world. That being said, learning that there are consequences for your actions is important because often, saying sorry is not recompense for actions. My daughter is getting to the age where I think preschool is right for her. I really appreciate that you point out that the school I choose should be a great place for her to learn through playing. I’ll have to keep this in mind as I search for the best preschool for her. I’m a wife, mom, writer, and former special ed preschool teacher turned SAHM. Currently living on coffee and soaking up the beautiful mess that is motherhood. See more of my story here. Some Our Daily Mess posts contain affiliate links. These may be hyperlinks within the body of text or marketing banners which connect to third-party sites. If a product is purchased from such a site, Our Daily Mess may receive a commission payment. Our Daily Mess is a participant in the Amazon Services LLC Associates Program, an affiliate advertising program designed to provide a means for us to earn fees by linking to Amazon.com and affiliated sites. Need a positive parenting support system? 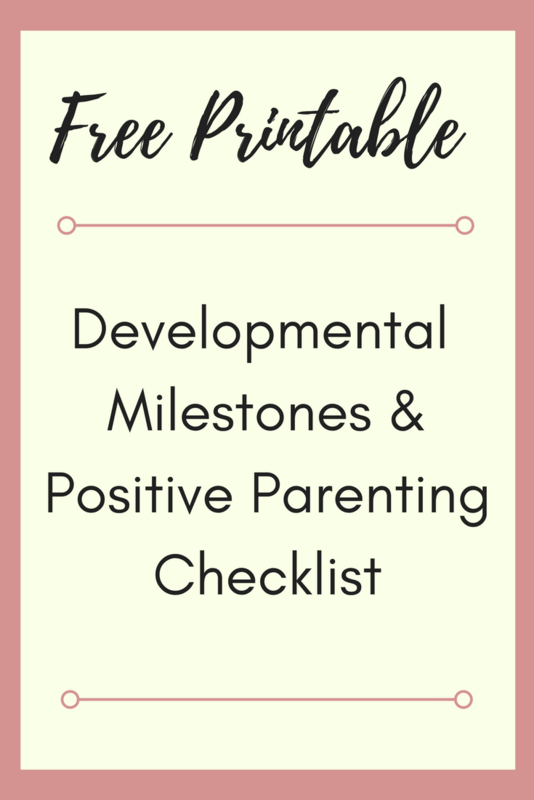 Sign up to get a free Positive Parenting and Developmental Milestones Checklist and start being a calm and connected mama today!